In the United States and Canada, ethnographers commonly classify indigenous peoples into ten geographical regions with shared cultural traits, called cultural areas. Greenland is part of the Arctic region. Some scholars combine the Plateau and Great Basin regions into the Intermontane West, some separate Prairie peoples from Great Plains peoples, while some separate Great Lakes tribes from the Northeastern Woodlands. Indigenous peoples of the Great Plains are often separated into Northern and Southern Plains tribes. Arapaha, north central Florida and south central Georgia? Nota bene: The California cultural area does not exactly conform to the state of California's boundaries, and many tribes on the eastern border with Nevada are classified as Great Basin tribes and some tribes on the Oregon border are classified as Plateau tribes. The regions of Oasisamerica, Aridoamerica, and Mesoamerica span multiple countries and overlap. Partially organized per Handbook of South American Indians. Anthropologist Julian Steward defined the Antilles cultural area, which includes all of the Antilles and Bahamas, except for Trinidad and Tobago. The Central American culture area includes part of El Salvador, most of Honduras, all of Nicaragua, Costa Rica, and Panama, and some peoples on or near the Pacific coasts of Colombia and Ecuador. The Colombia and Venezuela culture area includes most of Colombia and Venezuela. 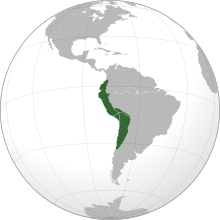 Southern Colombia is in the Andean culture area, as are some peoples of central and northeastern Colombia, who are surrounded by peoples of the Colombia and Venezuela culture. 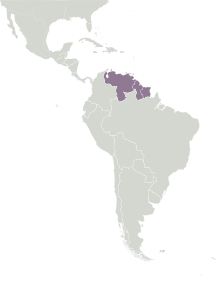 Eastern Venezuela is in the Guianas culture area, and southeastern Colombia and southwestern Venezuela are in the Amazonia culture area. 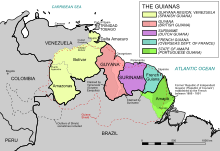 This region includes northern parts Colombia, French Guiana, Guyana, Suriname, Venezuela, and parts of the Amazonas, Amapá, Pará, and Roraima States in Brazil. 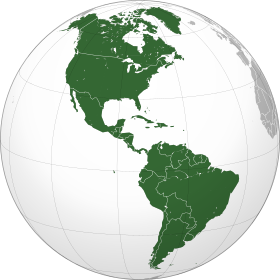 Indigenous languages of the Americas (or Amerindian Languages) are spoken by indigenous peoples from the southern tip of South America to Alaska and Greenland, encompassing the land masses which constitute the Americas. These indigenous languages consist of dozens of distinct language families as well as many language isolates and unclassified languages. Many proposals to group these into higher-level families have been made. 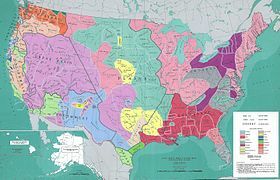 According to UNESCO, most of the indigenous American languages in North America are critically endangered and many of them are already extinct. The haplogroup most commonly associated with Indigenous Americans is Haplogroup Q1a3a (Y-DNA). Y-DNA, like (mtDNA), differs from other nuclear chromosomes in that the majority of the Y chromosome is unique and does not recombine during meiosis. This has the effect that the historical pattern of mutations can easily be studied. The pattern indicates Indigenous Amerindians experienced two very distinctive genetic episodes; first with the initial-peopling of the Americas, and secondly with European colonization of the Americas. The former is the determinant factor for the number of gene lineages and founding haplotypes present in today's Indigenous Amerindian populations. 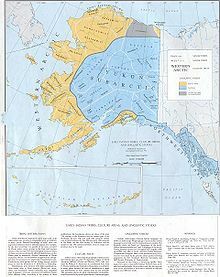 Human settlement of the Americas occurred in stages from the Bering sea coast line, with an initial 20,000-year layover on Beringia for the founding population. The micro-satellite diversity and distributions of the Y lineage specific to South America indicates that certain Amerindian populations have been isolated since the initial colonization of the region. 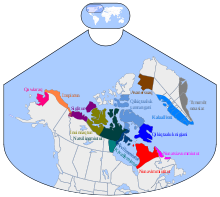 The Na-Dené, Inuit and Indigenous Alaskan populations exhibit haplogroup Q (Y-DNA) mutations, however are distinct from other indigenous Amerindians with various mtDNA mutations. This suggests that the earliest migrants into the northern extremes of North America and Greenland derived from later populations. ^ "Culture Areas Index". the Canadian Museum of Civilization. ^ "Dena'ina." Alaska Native Language Center. Accessed December 10, 2016. ^ "Slavey". The Canadian Encyclopedia. Historica Canada. Retrieved 10 December 2016. ^ a b c d "Preamble." Constitution of the Pawnee Nation of Oklahoma Archived 2013-10-07 at the Wayback Machine. Retrieved 5 Dec 2012. ^ a b c d e f g h i j k l m n o p q r s t u v w x y z aa ab ac ad ae af ag "Cultural Thesaurus". National Museum of the American Indian. Accessed 8 April 2014. ^ a b c d Frank, Andrew K. Indian Removal. Archived 2009-09-30 at the Wayback Machine Oklahoma Historical Society's Encyclopedia of Oklahoma History and Culture. Retrieved 10 July 2009. ^ Haliwa-Saponi Tribe. . Retrieved 10 July 2009. ^ Milanich 1999, p. 49. ^ Milanich 1996, p. 46. ^ a b c Loether, Christopher. "Shoshones". Encyclopedia of the Great Plains. Retrieved 20 Oct 2013. ^ Nicholas, Walter S. "A Short History of Johnsondale". RRanch.org. Archived from the original on 2010-10-31. Retrieved 2010-06-04. 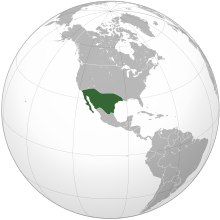 ^ a b c d e f g h i j "Mexico: Map". Ethnologue. Retrieved 16 November 2015. ^ "Paipai Language (Akwa'ala)". Native Languages of the Americas. Retrieved 10 Sept 2010. ^ a b c d Steward, Julian H. (1948) Editor. Handbook of South American Indians. Volume 4 The Circum-Caribbean Tribes. Smithsonian Institution Bureau of American Ethnology Bulletin 143. 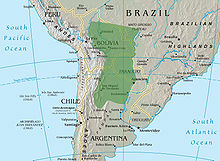 ^ a b c d e f g h i j k l m n o p q r s t u v w x "Languages of Bolivia". Ethnologue. Retrieved 23 Oct 2012. ^ "Huachipaeri". Ethnologue. Retrieved 18 Feb 2012. ^ "Puelche". Encyclopædia Britannica. Retrieved 1 December 2016. ^ Gordon, Raymond G., Jr. (Ed.). (2005). Ethnologue: Languages of the world (15th ed.). Dallas, TX: SIL International. ISBN 1-55671-159-X. (Online version: http://www.ethnologue.com)[permanent dead link]. 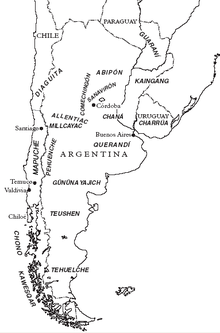 ^ "Y-Chromosome Evidence for Differing Ancient Demographic Histories in the Americas" (PDF). Department of Biology, University College, London; Departamento de Gene´tica, Universidade Federal do Rio Grande do Sul, Porto Alegre, Brazil; Instituto Venezolano de Investigaciones Cientı´ficas, Caracas, Venezuela; Departamento de Gene´tica, Universidade Federal do Parana´, Curitiba, Brazil; 5Department of Anthropology, University of New Mexico, Albuquerque; 6Laboratorio de Gene´tica Humana, Universidad de los Andes, Bogota´; Victoria Hospital, Prince Albert, Canada; Subassembly of Medical Sciences, Mongolian Academy of Sciences, Ulaanbaatar, Mongolia; Laboratorio de Gene´tica Molecular, Facultad de Medicina, Universidad de Antioquia, Medellı´n, Colombia; Université de Montréal. University College London 73:524–539. 2003. Retrieved 2010-01-22. ^ Orgel L (2004). "Prebiotic chemistry and the origin of the RNA world" (PDF). Crit Rev Biochem Mol Biol. 39 (2): 99–123. doi:10.1080/10409230490460765. PMID 15217990. Retrieved 2010-01-19. ^ Wells, Spencer; Read, Mark (2002). The Journey of Man – A Genetic Odyssey (Digitised online by Google books). Random House. ISBN 0-8129-7146-9. Retrieved 2009-11-21. ^ "Summary of knowledge on the subclades of Haplogroup Q". Genebase Systems. 2009. Archived from the original on 2011-05-10. Retrieved 2009-11-22. ^ Ruhlen M (November 1998). "The origin of the Na-Dene". Proceedings of the National Academy of Sciences of the United States of America. 95 (23): 13994–6. doi:10.1073/pnas.95.23.13994. PMC 25007. PMID 9811914. D'Azevedo, Warren L., volume editor. Handbook of North American Indians, Volume 11: Great Basin. Washington, D.C.: Smithsonian Institution, 1986. ISBN 978-0-16-004581-3. Hann, John H. "The Mayaca and Jororo and Missions to Them", in McEwan, Bonnie G. ed. The Spanish Missions of "La Florida". Gainesville, Florida: University Press of Florida. 1993. ISBN 0-8130-1232-5. Hann, John H. A History of the Timucua Indians and Missions. Gainesville, Florida: University Press of Florida, 1996. ISBN 0-8130-1424-7. Hann, John H. (2003). Indians of Central and South Florida: 1513-1763. University Press of Florida. ISBN 0-8130-2645-8. Heizer, Robert F., volume editor. Handbook of North American Indians, Volume 8: California. Washington, D.C.: Smithsonian Institution, 1978. ISBN 978-0-16-004574-5. Milanich, Jerald (1999). The Timucua. Wiley-Blackwell. ISBN 0-631-21864-5. Retrieved June 11, 2010. Steward, Julian H., editor. Handbook of South American Indians, Volume 4: The Circum-Caribbean Tribes. Smithsonian Institution, 1948. Sturtevant, William C., general editor and Bruce G. Trigger, volume editor. Handbook of North American Indians: Northeast. Volume 15. Washington DC: Smithsonian Institution, 1978. ASIN B000NOYRRA. This page was last edited on 17 April 2019, at 00:27 (UTC).